The Villa within Quinta Del Encanto is comprised of three residential accommodations; each quite private, commanding an incredible bay and coastline view. Within the Villa residences may be used together to create a 4-bedroom, 4-bathroom, 2-kitchen hideaway for up to 8 people, or separately depending upon your needs (please refer to each unit for pricing). The Villa is staffed with a housekeeper from Monday to Saturday and groundsman 24/7 houseman. A delightful two-bedroom with queen beds, two-bathroom with a large living room and dining room opening directly to a bay and sunrise view terrace. Casa Alegre has terraces off the bedrooms and a 360-degree view roof terrace. The main terrace has a curving staircase that descends to the Venetian-tiled pool. And a furnished terrace on the roof giving amazing daytime and nighttime views. The bedrooms are air conditioned for your comfort. All main rooms have ceiling fans. Casa Alegre's rate is $195/ night - max 4 persons. This house may be rented with 'Casita Amanecer' and/or 'Casita Chiquita.' Consult us for a special combined rate. The rate for The Villa (Casa Alegre, Casita Amanecer & Casita Chiquita) is $345/ night- max 8 people. The Villa at Quinta del Encanto is a perfect hillside vacation residence with breath-taking ocean and marina vistas and comforts you will never forget. Leave your cares at home and the crowds of Puerto Vallarta on the other side of the Bahia de Banderas and relax poolside at this enchanting Mexican vacation villa on Mexico's Riviera Nayarit Coastline. Lifestyle is the key word at our Villa.....enjoy the Lifestyle we have created for ourselves the moment you enter the Villa. While sitting on the terraces of the Villa, you can see the beaches of Bucerias, the coastline of Nuevo Vallarta, the coastal resort of Puerto Vallarta, Riviera Nayarit Marina and the Bahia de Banderas shoreline. A taxi zone is available minutes away. The local beaches and village are a delightful five minute stroll. Fabulous restaurants are within walking distance or request our chef to join you during your stay for wonderful meals at the Villa. The aqua lagoons and coral-sand surfing beaches of the Bahia de Banderas coastline can be viewed on route to Punta de Mita, within 15 minutes from the Villa. Award winning San Diego interior designer. Convenient to family and friends. Beautiful area, airport 30 minutes from home and still next to the tropical jungle of the Riviera Nayarit. Lifestyle...........great staff, great villa, great views and relaxing at the pool is the best. Casa Alegre has one bath on each floor. 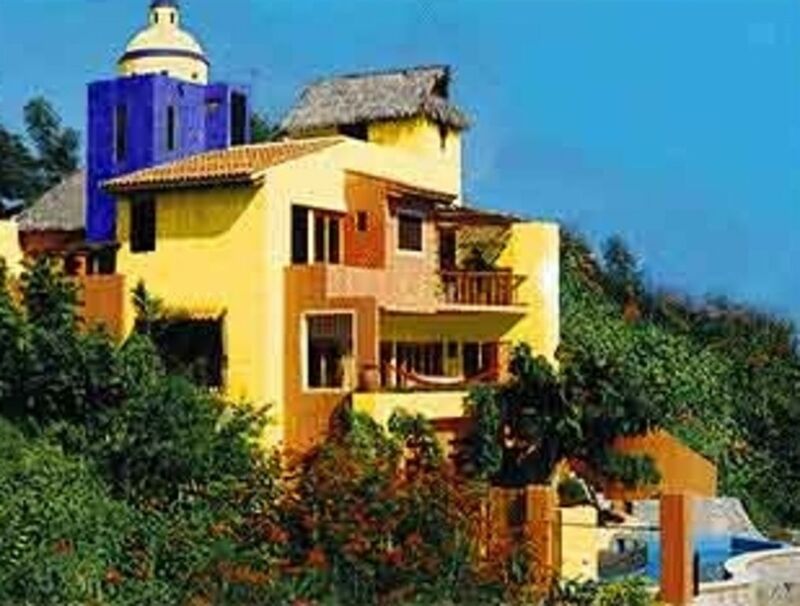 both have showers and the second floor bath is pictured with the amazing shower overlooking the Banderas Bay! Casita Amanecer and Casita Chiquita have their own in suite bathrooms. In the Villa, all bedrooms are air conditioned. Casitas are fully air conditioned. Lots of street parking next to Villa with security 24/7. Ask for passcodes for great internet coverage. There are two TV's in Casa Alegre and one TV each in Casita Amanecer and Casita Chiquita! Can be rented as 1 bedroom, 2 bedroom, 3 bedroom or 4 bedroom Villa. You are able to choose the size of accommodation that fit your travel plans. Daily maid service, On site security. Two night stay minimum required. We accept all major credit cards.